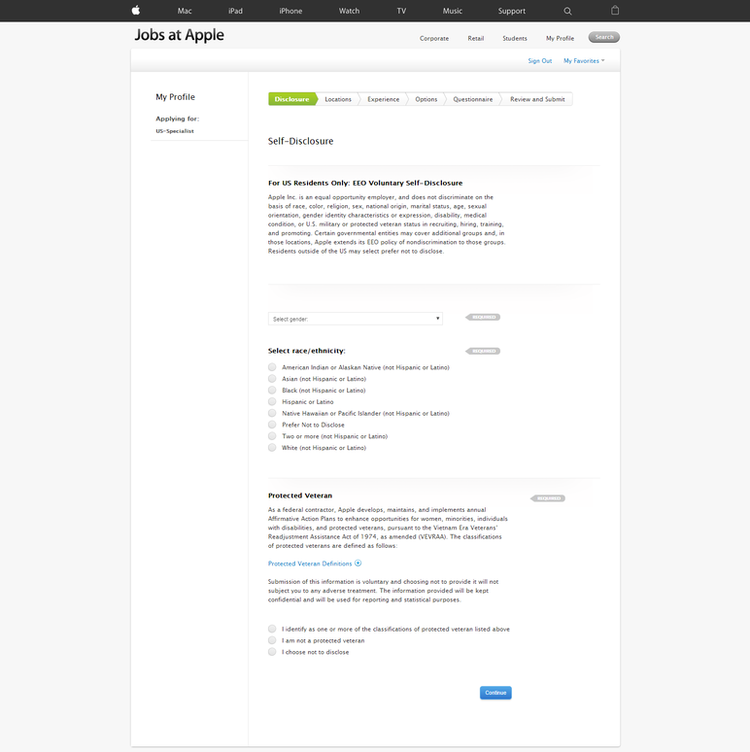 To apply for an Apple job, you shall at first go to www.apple.com/jobs/us, and select a department you’d like to work at from Corporate, Retail and Student Programs. 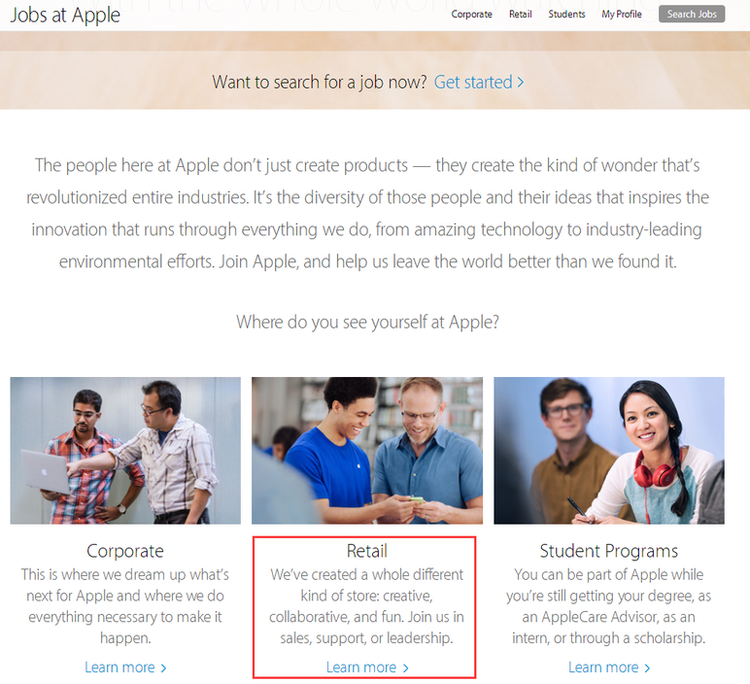 Taking Retail for instance, click “Learn More” to see accessible jobs there. Or you can click “Get Started” to search for your pointed jobs by entering some information, such as keywords, location and so on. After you’ve decided what department you prefer and click “Learn More”, several job categories will be shown on the new page. 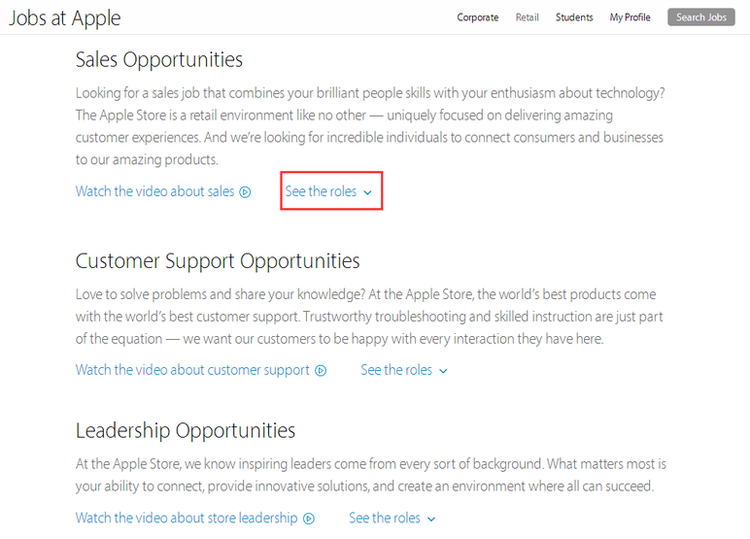 You shall select a category from sales opportunities, customer support opportunities and leadership opportunities. 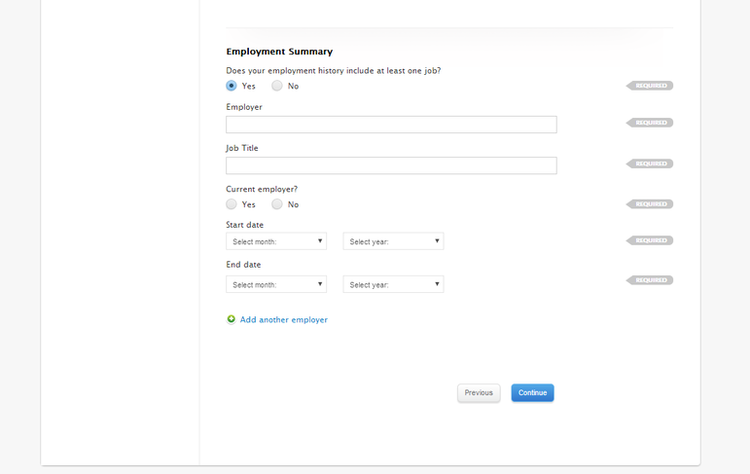 Click “See the roles” of your chosen job category, and certain current job types will be listed below the job category. You shall choose one according to your personal qualifications and experience. 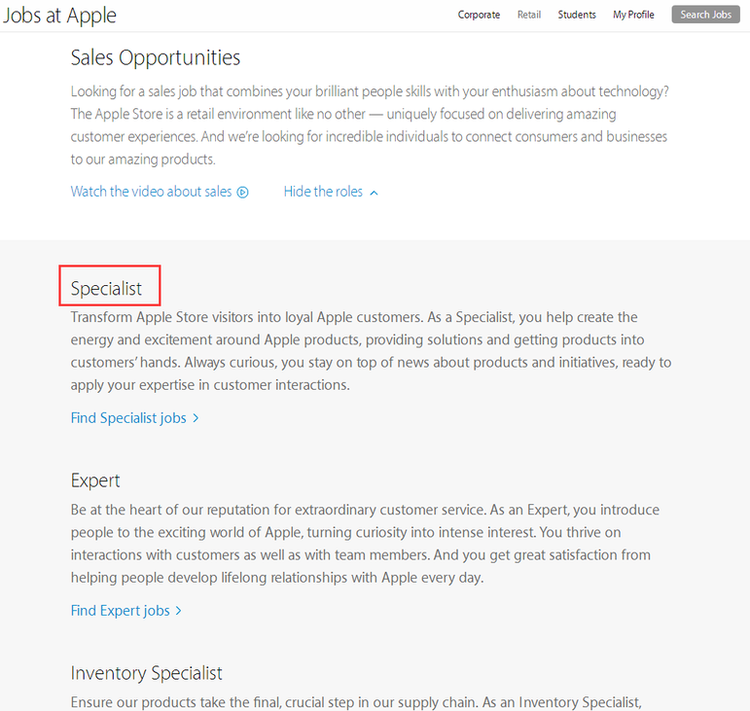 Taking Specialist for example, click “Find Specialist jobs” and then several accessible positions will be presented. You shall choose one proper position and apply for it right now by clicking “Submit resume” after you’ve read thoroughly about the job description. 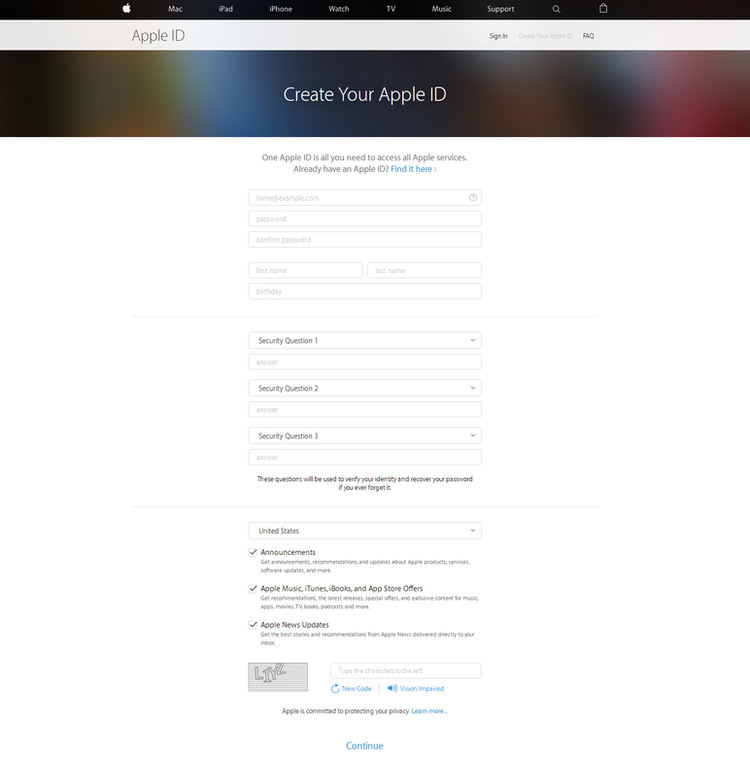 To start your online application, you need to create your Apple ID by offering some of your basic information. Or you may simply sign in if you have already registered. The first step of your application is to complete your self-disclosure, within which you need to select your gender, race and tell if you are a protected veteran. Selecting a location near you will be helpful for you to filter all useless information and find out the pointed jobs you are looking for. To continue your online application, you are required to tell about your experience by uploading your resume. You shall also submit your contact information, tell your employment history, answer certain questions and so on to complete your online application. Be sure that you have filled out all fields within the application process. You will be contacted soon if you are proved to be qualified for the position. 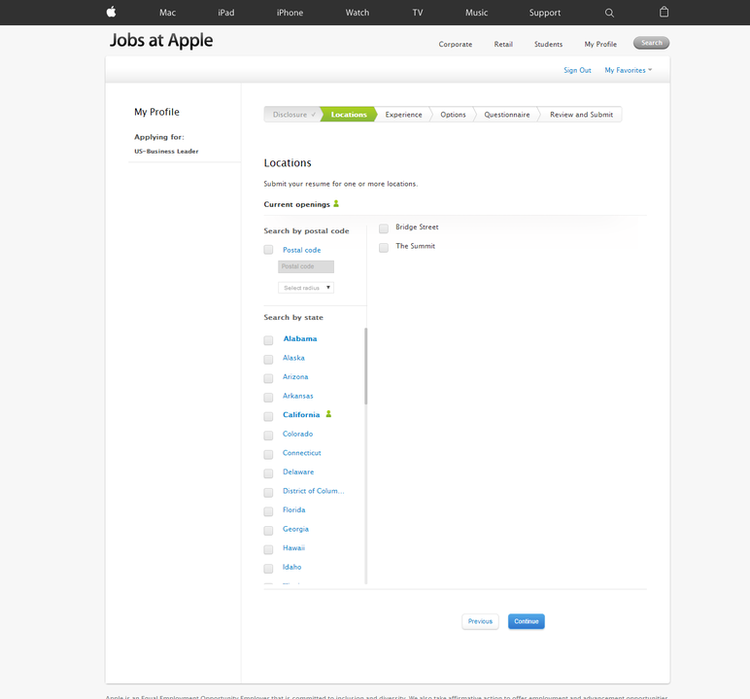 Click apple.com/jobs to apply for Apple jobs online.